Doosan Industrial Vehicle America Corp.’s Parts Distribution Center (PDC), located in Buford, GA, is housed in a 150,000-square foot facility. Utilizing state-of-the-art computerized order placement and tracking systems, the Parts Distribution Center supports over 200 Doosan dealer locations throughout North and South America and the Caribbean. The Parts Distribution Center houses several hundreds of thousands of line items annually and maintains on-shelf inventory. The available levels of inventory allow the PDC to provide industry-leading availability of the parts you need when you need them. Doosan proudly ensures that customers never pay inflated freight costs due to lack of part availability. The PDC employs a well-trained, fully staffed call center of knowledgeable technical support staff available to assist with client requests. Doosan’s Parts Distribution Center strongly supports and encourages its dealers to maintain an ample supply of Doosan parts to better meet customer needs. By providing such support, vehicle owners are guaranteed to find the right part, at the right price, as quickly and as easily as possible. 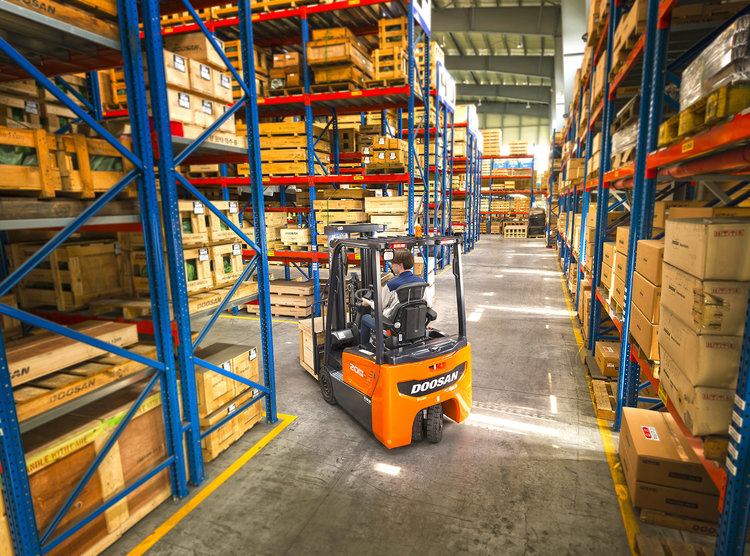 The ownership of a Doosan Industrial Vehicle is an affordable, cost-effective, and critical element of your material handling business.